With IT Cosmetics Hello Light crème Anti-Aging Radiance Crème Luminizer, you can achieve a beautiful, lit-from-within complexion. This innovative, anti-aging crème luminizeris infused with real silk, hydrolyzed collagen, peptides and antioxidants to glide effortlessly over lines and wrinkles. Hello Light Crème™ Luminizer utilizes proprietary Drops of Light Technology™, a revolutionary, radiance-boosting complex that harnesses light-mimicking, optical-blurring liquid crystals, To give you the most flawless, natural-looking glow. Apply it onto your cheekbones, brow bones, center of forehead, inner corners of eyes, and down the center of your nose. Anywhere you wish to enhance and bring forward! Developed with plastic surgeons, this luxe crème illuminates without glitter or shimmer, and works beautifully on bare skin or over your favorite foundation. It brightens, hydrates and awakens your skin without settling into lines and wrinkles, the universal shade looks flawless on all skin types and tones and it contains anti-aging peptides, hydrolyzed collagen and real silk to create your most supple, healthy-looking complexion. To use: apply to the areas of your face you wish to appear lifted or to add light too, including your cheekbones, brow bones, center of forehead, inner corners of eyes, and down the center of your nose for a lit-from-within glow. See enclosed how-to guide for reference. 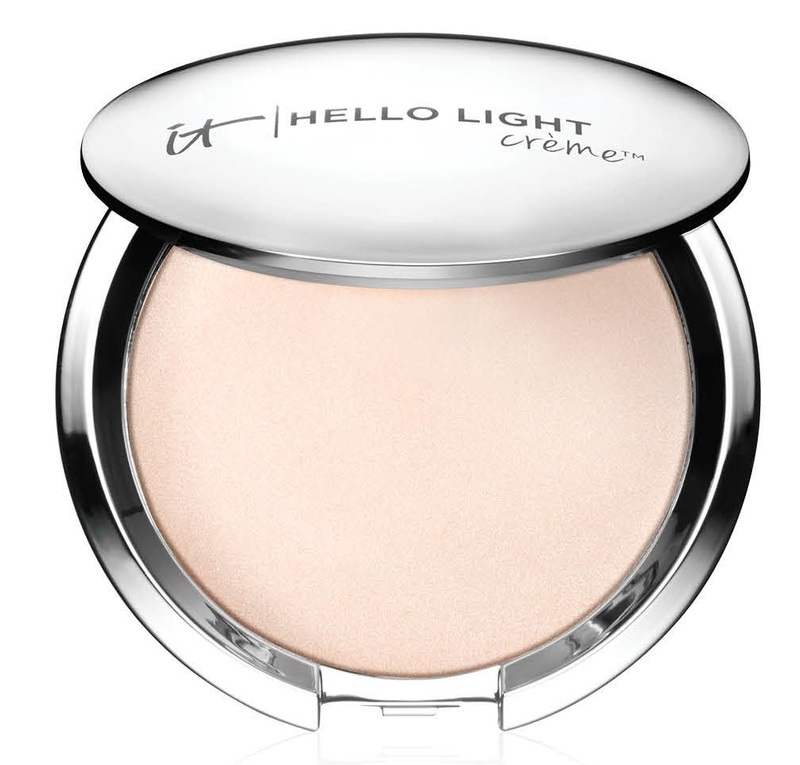 Mix a bit of Hello Light Crème™ Luminizer with your favorite moisturizer or liquid foundation for an all-over youthful glow! I personally find this product to be perfect for a nice subtle glow that is great when you want a beautiful lit-from-within glow but don't want too much shimmer or don't want to add a highlighter or don't want it too look unnatural. It adds just the right glow to the skin and doesn't go over the top. The color does indeed look good on any and all skin tones, is easy to use, makes skin look amazing and doesn't make skin look too shimmery or glowy. I like that this product can be used with a light hand or a heavy hand and you still get a perfect look. Hello Light crème Anti-Aging Radiance Crème Luminizer retails for $24.00 and can be found online at www.itcosmetics.com, www.qvc.com, www.sephora.com and www.ulta.com as well as anywhere IT Cosmetics is sold. Like IT Cosmetics on Facebook:https://www.facebook.com/itcosmetics; Follow IT Cosmetics on Twitter:@itcosmetics; Follow IT Cosmetics on Snapchat:https://www.snapchat.com/add/it_cosmetics; Follow IT Cosmetics on Pinterest:http://www.pinterest.com/itcosmetics/; Follow IT Cosmetics on Instagram:https://www.instagram.com/itcosmetics/ and Subscribe to IT Cosmetics on YouTube: https://www.youtube.com/user/itcosmetics.